The arrival of spring in Toronto is usually celebrated by a meal and/or cocktail on a newly re-opened patio. Those activities were occurring throughout the city today as winter-weary Torontonians took advantage of the warm sunny weather. For Ted and myself, the arrival of spring was marked by an off-road excursion. We spent the afternoon on our motorcycles tearing through the muddy trails of a small island of undevelopped land within the GTA that we call the Pit. There were creeks to cross and hills to climb. At one point there was a fallen tree lying across our path that Ted discovered (the hard way) exceeded the clearance of his motorcycle, causing him get high-centred. I had my own misadventures during one of the creek crossings. I managed to get my rear wheel wedged against a submerged rock and dumped my bike in the middle of the stream. It was my first drop on my DRZ 400, so we marked the occaision with a photo after I picked my bike up out of the water (above left). The photo on the right shows Ted and his bike coated in mud, the result of him being too close behind me when I got stuck in a muddy hole. Yes my rear wheel sprayed him quite effectively as it spun wildly during my attempt to get unstuck. Ah, spring. I am giddy with anticipation of the upcoming riding season. (And drinks on patios). Icefields Parkway, Between Banff and Jasper, Alberta Rockies. Many people have been asking us where we will go for our next adventure. How do you top Toronto to Buenos Aires or London to Cape Town? Especially when you only have two weeks of vacation? My response has been that we would make a run for the arctic circle. Alas, even this is has turned out to be overly optimistic. The distance from Toronto to Calgary is about 3,500 kms. From Calgary to Inuvik, it is another 3,300 kms, and the last several hundred of those are on reasonably rough road. 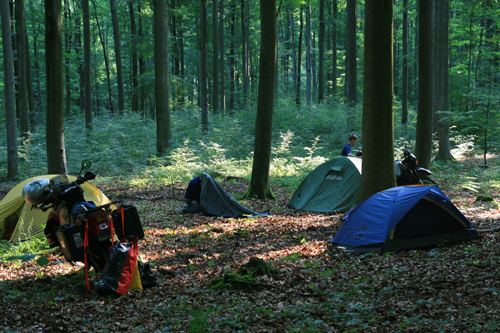 It is not possible to cover nearly 14,000 km in only 2 weeks and still enjoy yourself (especially on a dirt bike). Thus we have decided to delay our trip to the Arctic until we have more time. 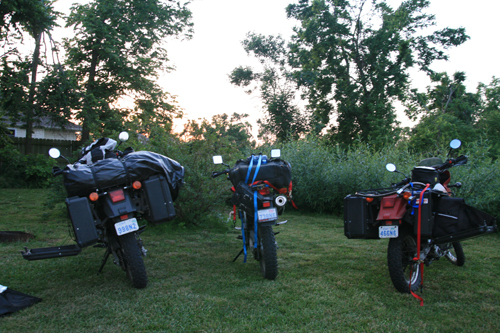 Instead, this summer we will ride from Toronto to the Alberta Rockies. We will travel the northern shores of the Great Lakes to reach the prairies. Then we will circle northward and cross Manitoba and Sakstachewan as far north as we can while working our way westwards through the bush, camping along the way. I am sure that we will be able to find plenty of dirt as we go. 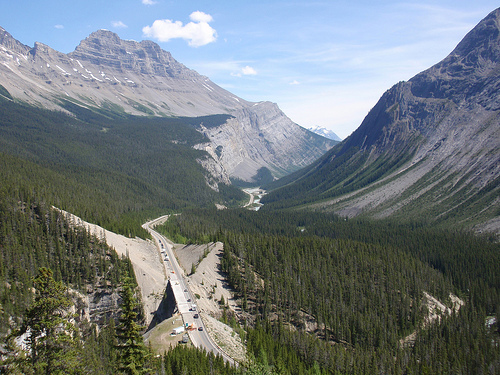 Once in Alberta we will head south to Jasper and then take the famous Icefields Parkway to Banff. The Suzuki DRZ400 is the bike that both Jeremy and myself will be taking for this trip. With the help of A Vicious Cycle and Happy Trails, we are in the process of making our bikes adventure-ready. From AVC, I am ordering a corbin seat for the long hours in the saddle. We are also going for Clarke 3.9 gallon gas tanks. From Happy Trails, we are going to equip our bikes with aluminum panniers mounted to SU racks. These are the racks that held up so well on our London to Cape Town adventure. The weather over the past week has finally been hinting that spring is approaching. I have started riding my DRZ to work again. Although it is warmer than it was, it is still bloody cold. I have been using my electric vest heavily, but unfortunately the DRZ stator has not been generating enough power for this luxurious accessory. I have had to charge my battery a couple of times. To reduce the overall wattage demand, I am going to install an LED tail light and perhaps a headlight switch so that I can turn off my headlight while using the vest. Especially after what happened today. Today I rode out to T.O. Cycle to get a new front wheel installed (the old one was bent out of shape and the result was a scary wobble at speeds over 90 km/h). By the time I got out there (a half hour ride), my electric vest had completely drained the battery. After the wheel was installed, I had the guys push me so I could bump start the bike, and I set off for the ride back without the benefit of electricity’s warmth. Luckily by then the temperature had climbed to a balmy 4 degrees Celcius. Once on the Gardiner Expressway, I moved to the left lane to see if the new wheel eliminated my higher speed wobble. Previously, I had not dared go beyond about 130 km/h because of the wobble. Because the new wheel did not accomodate the stock speedo (tomorrow I will install a Trail Tech Vapour), I had no idea how fast I was actually going. The only way to be sure if there was an improvement was to pin it. At maximum speed the old wheel would have bucked me off. If I could pin it with the new wheel, then I could be satisfied that I had made a good investment. As I was accelerating at full throttle, however, I suddenly lost power. Then the engine cut out. I pulled to the emergency lane on the left side as heavy traffic raced past me. What had happened? I inspected the bike. The chain was fine. The battery was not – in fact, the green neutral light barely flickered. Luckily a car had already stopped ahead of me, and the driver was walking back towards me. It turns out that when he’s not forced to drive a car he prefers to get around on a GSXR, and he himself had broken down once before on this very section of freeway on his rocket of a sportbike (a truly awful place for a breakdown by the way). With him pushing, I tried to bump start the bike. Three tries and nothing. Then I turned to him and said “I think I have two problems – a dead battery and no gas.” I switched the tank to reserve and he pushed me once more, and this time we were rewarded with the sound of a roaring engine. After merging back onto the freeway, I noticed a radar trap under an overpass about a kilometre ahead of where I had been sidelined. That would have been about the point where I would have reached top speed had I not suddenly lost power. What a lucky time to run out of gas. I am looking forward to spring like a kid before Christmas. I can’t wait to get back in the saddle. I am sure I am not the only one. 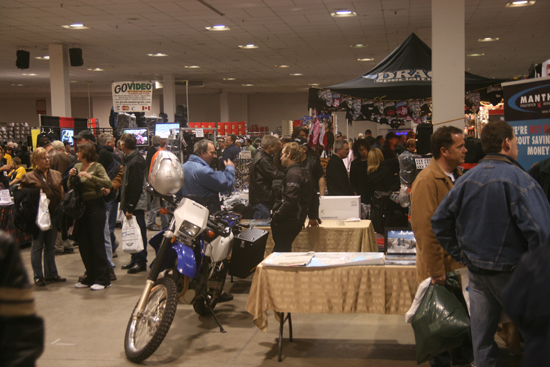 For anyone who is itching to get back on the trail, the Toronto Spring Motorcyle Show is the perfect starting point. It is being held at the International Centre April 4th and 5th, 2009. We will again have a booth set up where we will have pictures and maps depicting our Africa trip. We will also be selling our Dignitas Calendars to raise money for HIV sufferers in Africa. In addition, we will be displaying our adventure-ready DRZ400s. 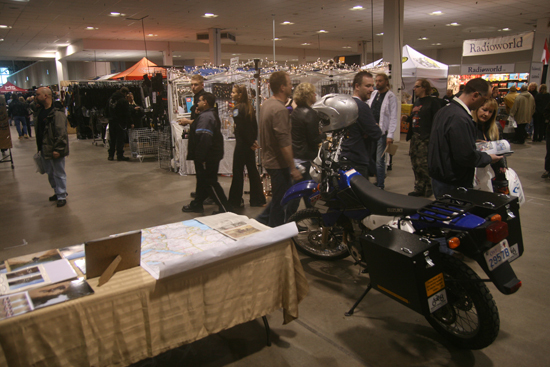 Please drop by to support or cause and/or chat about motorcycle adventure touring.